Toffee apples are an amazing thing but I find them rather too sweet so I got to thinking that salted caramel apples should totally be a thing (I know, I know, I am obsessed) I made a spiced apple sponge with salted caramel Italian Meringue Buttercream. 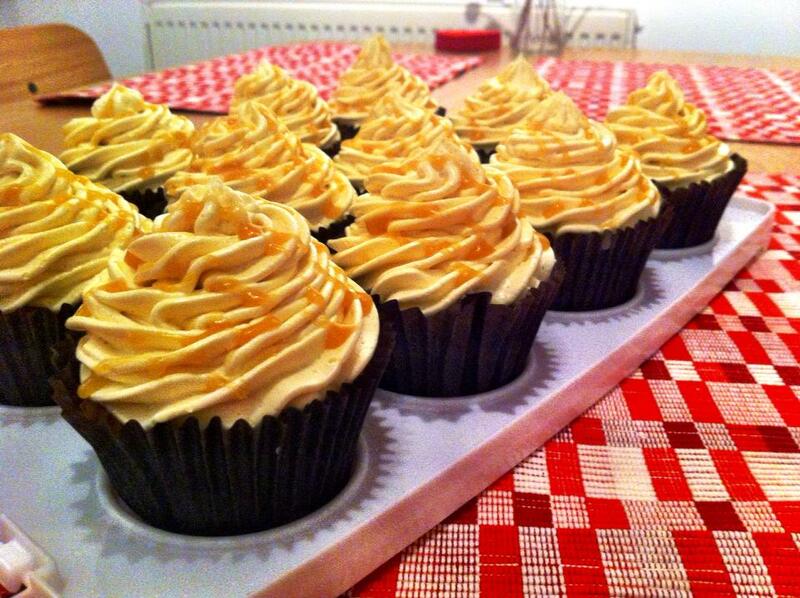 The sharpness of the apples was a good contrast to the salty/sweet icing. Peel and core apples. Cube into little cubes (no bigger than 0.5cm). Sprinkle cubed apples a bit of lemon juice to avoid browning. Melt the 25g extra butter in a large frying pan; cook apple cubes until browned lightly (about 5 minutes). Add brown sugar and saltanas (including soaking rum if used, if not drain the water off); cook stirring until it goes nice and thick (about 5 more minutes). Allow to cool completely. 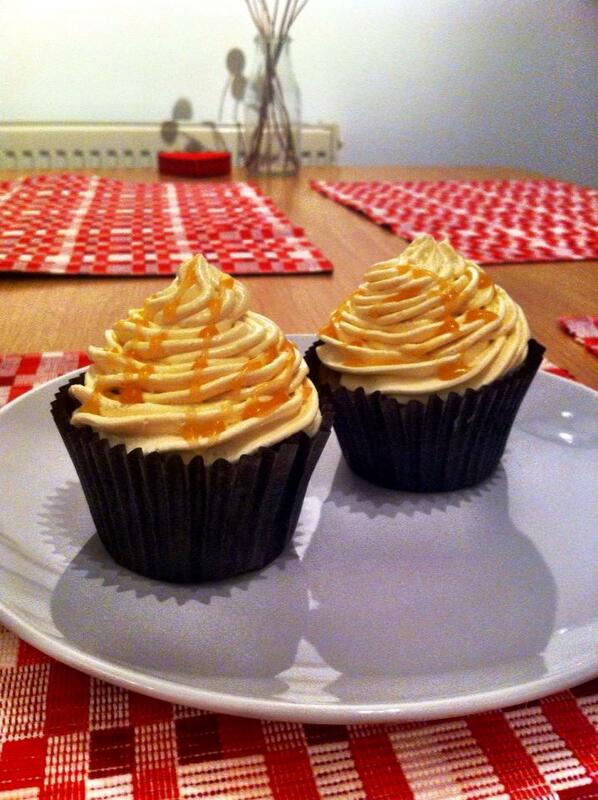 Beat together the butter and caster sugar until light & fluffy. Beat in eggs, one at a time, beating well after each one. Add flour and milk in 2 batches folding in gently. Fold in the apple mixture into the cake mixture until totally combined.Fill cases to about 3/4 full. Bake for 18-20 minutes (till golden brown springy). Put sugar, golden syrup and water in a medium heavy bottomed saucepan and stir until totally combined. Brush the inside of the saucepan with clean water on a damp pastry brush to dislodge any stray grains. Set over high heat and bring to a rapid boil. When the sugar mixture has come to the boil add a sugar thermometer and keep cooking until it reaches will into soft ball stage, 121°C. 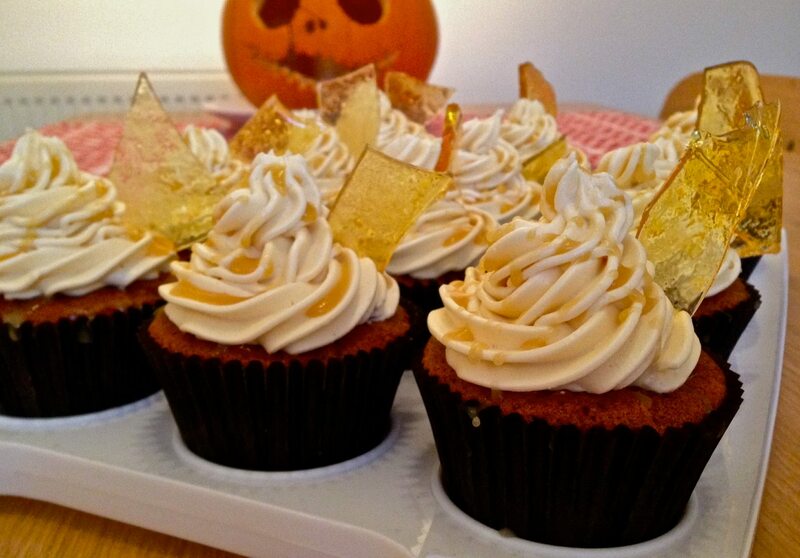 I used the left over icing a week later on a version of these cupcakes: https://bakeitinstinct.com/2013/07/08/salted-caramel-oh-salted-caramel/ and added sugar glass for some slightly Halloweeny decoration.